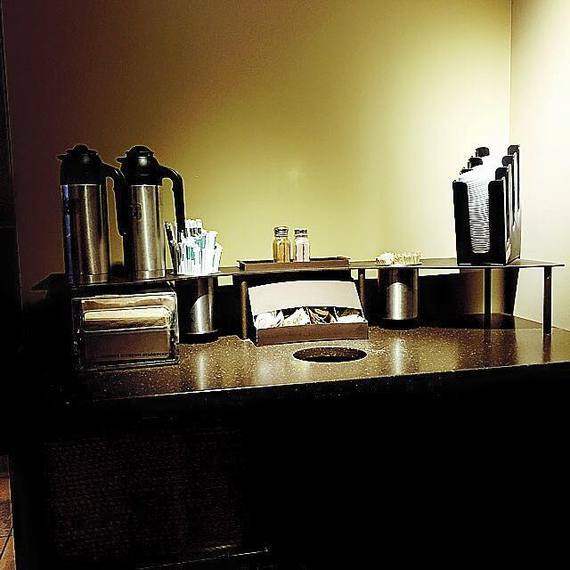 As a writer and a long distance runner, I spend a lot of my day in Starbucks locations across the city, and for years I've had a massive pet peeve about their condiment stations. Anyone who has ever navigated one of these stations knows how poorly designed they are in that you are compelled to reach in front of someone else in order to get a lid or to grab the milk carafe. I've never understood why Starbucks, the masters of uniformity and efficiency, couldn't design a better station. Having said that, you can imagine my surprise when just last week, this petty daily resentment suddenly left me, and it's with somewhat of a heavy heart that I admit to you that I've come to love this impromptu "milk-lid dance" I participate in several times a day. No matter how much of a rush I'm in or how lost I am in my own little world, this shuffle, reach, and bend dance encourages me to make small talk--fleeting though it may be--and to maintain civility with other folks in my city. Come to think of it, maybe Starbucks has much more business savvy than I gave them credit for. So what do you think brought about this radical shift in my thinking? Although I'd like to say that it was my "enlightened" choice to let go of a niggling daily frustration, it really is nothing more than a simple shift in my perception. But even more, what this has made me realize is that much to my dismay, I'm actually a "happy person," not the melancholic tortured soul I've always considered myself to be, some romantic ideal of a man making his way along the margins of society. Like anyone else who makes it to middle age, I haven't arrived without swimming through my fair share of setbacks, trauma, and disappointments. There was a time in my life when I looked upon these experiences as something that left me broken, fractured, or in some way askew. I now see adversity as something that shapes me and to all account, strengthens me. There is no doubt that in a crisis, you meet a different part of yourself--and quite often it's in this meeting of yourself, that you truly come to find yourself. In an age of 24/7 connectivity, we very often feel a desperate need to carve out our own individual space amidst the endless stream of "likes", "shares", and "reposts." In so doing, we erect artificial barriers around ourselves, thereby depriving us of the one thing that can liberate us from much of our sadness--a recognition of the universality of human suffering. Despite the many knocks against social media being nothing more than mindless chatter about the mundanely egocentric comings and goings of our lives, I believe that the flipside to these "superficial interactions" is that they inadvertently open a window to the universal daily grind we all endure. I know that I mine a lot of inspiration from the people I engage with on social media, and this has happened to such a degree that it has caused me to redefine what I think "courage" means. Courage has nothing to do with "not being afraid." In fact, it's the complete opposite--it entails all that you will yourself to do when "you are afraid." Deep down, we are all in search of a little inspiration, a little hope. I was discussing this with a friend yesterday, and he told me that he sees "HOPE" as an acronym for Hearing Other People's Experience. I was blown away by the clarity of that concept, and how it perfectly encapsulates the power of connection and its ability to make us reach for greatness. So once again I find myself in need of a slight change of perspective. Instead of railing against the constant influx of digital connectivity, maybe it's time for me to really listen to and gain insight and inspiration from the experience of others. Today, I strive not to be remembered for making the most noise, but for creating the silence on which others can paint their words. Hope lies in connection, and in connection lies freedom.